This is the review of the binary options scam called „Profits Infinity“. It is presented by Mark Bromovich. 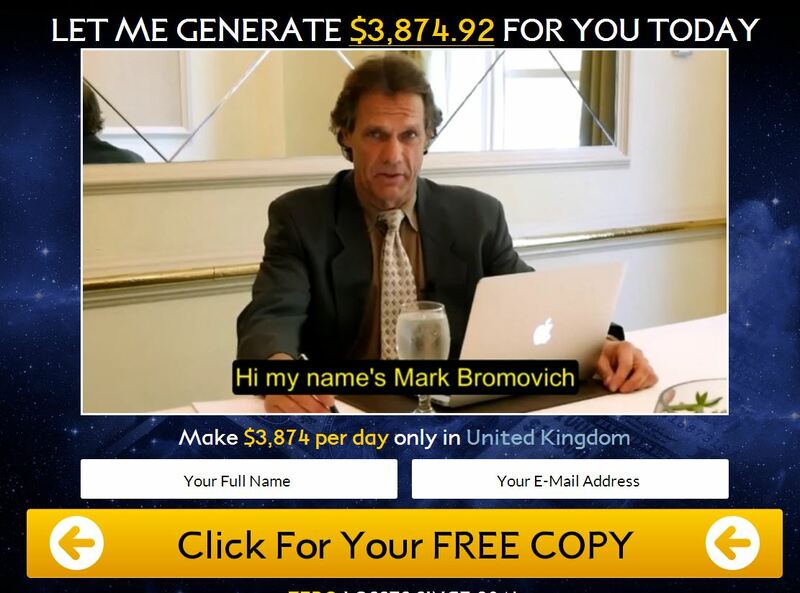 Bromovich claims to have a binary options trading software that can make you thousands of dollars per day. It is called Profits Infinity and it allegedly has not had a single losing trade for years. Now you can get Profits Infinity for free. The truth is that Bromovich is a fictitious character played by a paid actor. Scammers wrote a script and their only aim is to make you open a binary options trading account and deposit money with their broker, because it will earn them an affiliate commission. The rest is just a fairy tale designed to convince you to make them earn their commission. Let’s start with reviews. 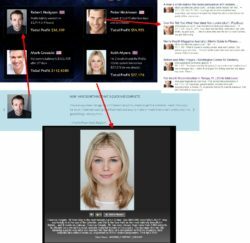 All the people you can see in the Profits Infinity video are hired actors, their testimonials are totally fake. The same applies to the testimonials on the web page. Look at the picture on the right, these photos were stolen from different places all over the Internet. In the video Bromovich is showing some trading account screenshots, but again, they are all fake. Look at the example on the right. He is showing his account with Interactive Options and you can see the date April 20, 2016. But Interactive Options have their licence suspended since March 3, so you cannot trade with them for more than a month and a half! This proves that the screenshot is fake. By the way you can also see it with Bromovich’s name that does not fit in the free space, it touches the box. And finally the best proof that Profits Infinity is a scam is in the trading app. It is the same app as used in the Lie Detector Millionaire and Click Cash Formula scams. They just changed the logo and colours. This software is a losing one, the feedback about it is absolutely clear. Profits Infinity is a scam that wants to take your money through false promises and lies, so stay away from it. If you are interested in trying binary options risk free, do it on a demo account. There you will understand that it takes work and learning to achieve profits in binary options trading. And do not look for free robots that will make money for you, they don’t exits. I want to thank you for educating us on how to be more careful and a little less gullible with options trading websites. I found this site after signing up with ProfitsInfinity before I made a deposit. I haven’t visited the rest of your website yet to learn more about your background and why you offer this help to the public. Do you have anything to offer the average person who is trying to find ways of making money online? Good luck to you. Hi, we are just exposing scams, there is a new binary options scam almost every day. We hate scammers, that’s why we do it. We don’t teach trading, there is a lot of other sites for that, like Babypips.